I really liked the Winter Village train station when it came out, but it it is so small, with no back wall / roof. I tried for many months and multiple design changes to get it to work, and then I recently stripped away most of the basic framework underneath to give it a cleaner foundation. This last attempt finally gave me the needed inspiration for the model as shown below. This is the result, with the LDD file available here at Bricksafe. I added a freight office, a bathroom (the toilet design was stolen from the Modular Pet Shop set but the sink is my idea) and a "stone" fireplace. Their is a loading dock for the freight section, and two detachable platforms for added track-side length. Most of the rear wall opens up 90 degrees to allow access to the inside, and the roof comes off for viewing the passenger section. The tower should have three of this clock print, while the reddish brown 1 x 4 tile on the rooftop-sign should have this "Mount Clutchmore" print. Here you can see all the many details of this model, including the removable roof, left and right sections of platform, swing open wall and the station itself. This new station might be built at some point in the future to replace my other rural station, of which about 60% of the older one's parts will be use to built this newer model. 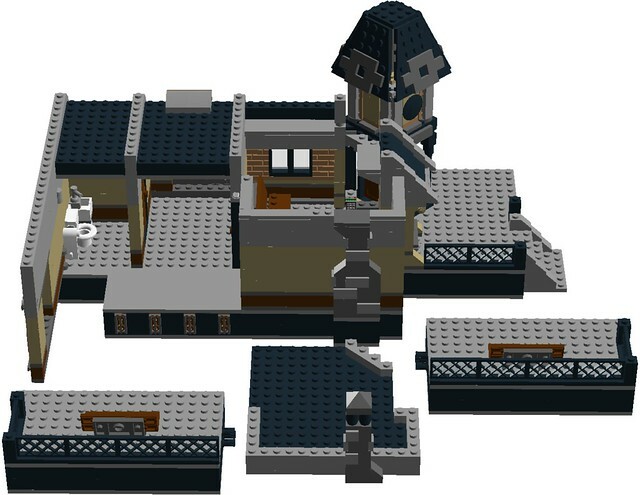 Fun Fact: This is my first building designed for my own personal LEGO town to include a bathroom! As usual, comments, questions, suggestions and complaints are always welcome!